The five-star Nambiti Hills Private Game Lodge offers intimate and luxurious accommodation in the midst of the spectacular African beauty of the Nambiti Game Reserve. It is a haven of sophistication surrounded by wild terrain. Perfect for anyone seeking both privacy and romance. Or simply time to reflect whilst searching for the Big Five or taking in the exquisite vistas from the quiet comfort of the lodge deck. Ideal for private getaways for the discerning, intimate weddings or corporate strategy meetings, Nambiti Hills has a unique combination of wide open spaces and discreet intimate places. Its lofty glass-enclosed dining and lounge areas provide panoramic views of rolling hills and savannah by day, and thousands of stars in the clear night sky. A wide verandah with its neighbouring bar spills out onto a waterfall that splashes into a rock pool where guests can float on cushions whilst sipping cocktails. Four indoor wood fires and two outdoor boma fires offer warmth, intimacy and another place to dine. There are also discreet enclaves leading off the bedroom suites where one can enjoy private meals and uninterrupted contemplation. There are eight luxury suites and one honeymoon suite at Nambiti Hills Private Game Lodge, each suite with a private viewing deck and an interior featuring a contemporary eclectic mix of local African design. 23 km east of Ladysmith in the extraordinarily beautiful and geographically diverse KwaZulu-Natal, lies Nambiti Big 5 Game Reserve, home to elephant, lion, leopard, buffalo and rhino. As well as over 30 other animal species. It is also rich in birdlife and indigenous flora. 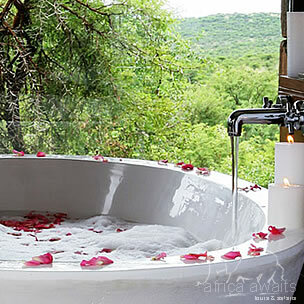 Often described as 'heaven on earth', the Nambiti Big 5 Game Reserve is also home to Nambiti Hills Private Game Lodge. At Nambiti Hills Private Lodge, we believe in taking you on a holistic safari, covering all spheres of the eco-system, from the smallest insects and different grasses to the magnificence of Africa's best known beasts, in as much detail as you desire. Our extremely knowledgeable senior guide and tracker will plan a personal safari that takes into account your particular interests and requirements. You can explore the reserve by 4x4, on foot or via helicopter. Or all three, if you so choose. The reserve has its own airfield and helipad. 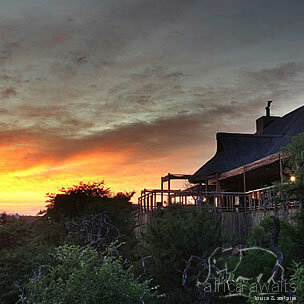 Nambiti Big 5 Game Reserve is close to the famous battlefields of the Anglo-Boer War and various other historic sites. It is also not far from the Drakensberg; a spectacular range of mountains with dramatic waterfalls, rivers, streams and caves that feature ancient San paintings on their rock faces. If you're interested in history, hiking and African culture, you will gain a great deal from a specially arranged personal tour of the area. Or you may decide that there is no richer pursuit than rest, and you will certainly get the best of that at Nambiti Hills. Eight luxury suites grace the land at Nambiti Hills Private Game Lodge, each one secluded to offer you the utmost privacy, a sanctuary in the wild African landscape. 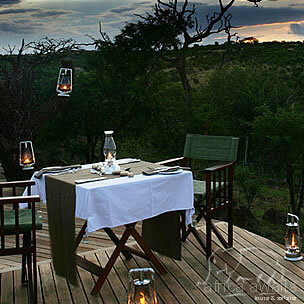 There is a private verandah that overlooks the game reserve and offers the ideal setting for intimate dinners. And an interior that is strongly influenced by the colours, patterns and textures of the wilderness in its well-considered combination of designs, materials and furnishings. Even the en suite bathroom with its spacious shower and extra large stone baths connects you with the beautiful exterior, coaxing you to soak while gazing into the savannah beyond. The honeymoon suite is spacious and grand, suspended from the hillside and offering the most spectacular views. On request special delicacies and treats can be prepared in our kitchen and brought to your suite. Nambiti Hills guides and expert animal trackers will take you through the rugged and pristine terrain of the Nambiti Big 5 Game Reserve in search of some of the most splendid animals in Africa. Along the journey, you will learn about the biodiversity of the grasslands, multitude of insects and the magnificence of the big five - elephant, rhino, buffalo, lion and leopard. A paradise for birders, the Nambiti Big 5 Game Reserve is home to 263 different species of birds. Birding drives can be arranged depending on numbers of guests resident at the lodge. If you want to experience the wild on foot, Nambiti Hills armed game guides will safely guide you on long walks through the enchanting Africa bush. This is subject to availability. There are a number of dams within the reserve which offer guests the opportunity to fish. These dams are well stocked with bass and various other fish species. Guests will be accompanied by a guide when fishing. The Drakensberg offers the best fly fishing in South Africa. There are excellent trout waters in the region with well-stocked dams and pristine stretches of river where brown and rainbow trout occur in abundance. With your holiday, safari or business trip from in to Nambiti Hills Private Game Lodge in Kwazulu Natal.